If you work in an office that celebrates birthdays, you may find yourself wondering what to bring to the office birthday party if you have either just started working there or perhaps worked there so long you are looking for some fresh ideas. Look no further! Not much of a cook? Your specialty could be finding some really great paper party goods. Themes are always fun so you might want to brainstorm some with co-workers before making the purchase. Be sure to get coordinating cups, napkins and paper plates as a bare minimum. But if you really want to make an impression, you can find some great printable party kits on Etsy that includes banners, toothpick flags, and much more. If you are into making food, some great birthday party food includes bite size appetizers that easily pop in the mouth without making a mess. 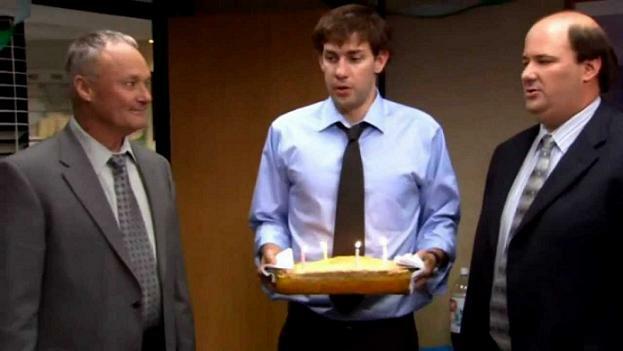 Remember, you are in an office environment where people frequently stand chatting and eating and don’t want to spend the remainder of their day wearing what they ate at the office birthday party. If you want to bring food, look over the food list, if one exists, and check out what others are bringing. This is a good idea for two reason, so you don’t duplicate someone else’s dish and it can also help you come up with an idea to compliment the selection. For example, if someone is bringing in pie, why not pick up some gourmet flavored ice cream? If you have a recipe that is a fan favorite, bring that if you know it is a proven crowd pleaser. It’s a nice and thoughtful touch to put a little hand made sign using a toothpick fork stating what the dish is and from who’s kitchen. If your dish contains nuts etc, it is also a great idea to add a little sign stating that for those with nut allergies. You will be viewed of as a considerate and observant co-worker. Beverages is another way you can shine without having to ever light the oven. Don’t just bring an ordinary bottle of soda though. Why not whip up a great batch of homemade lemonade or ice tea complete with adding some slices of lemon and bringing in a plastic pitcher to serve it once there. You don’t have to spend a lot to make an impression at your office birthday party. You just have to give it a little thought! These are great ideas and I really appreciate the allergy warning-so many people have allergies to food and it would be horrible to have a bad reaction at work especially during a party.